God’s children are likened to a flock of sheep throughout scripture, and the prophet Ezekiel speaks of them as such. In 34:26 he says, “… I will cause showers to come down in their season; there shall be showers of blessing.” This passage is eschatological with fulfillment in three stages, beginning now with the “church age” and continuing into the millennium and the world to come. Today let us focus on the present, the now, where the blessings are largely spiritual but also have a foretaste of the literal, that time when we will experience the ultimate consummation of the passage. 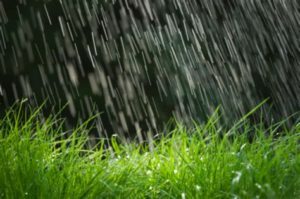 Psalm 72:6 is a companion verse, which some may see as referring to Solomon, but it also is eschatological and speaks of Messiah’s reign, “He shall come down like rain upon the grass before mowing, like showers that water the earth.” Like showers of rain or heavy night dew in the heat of summer refresh and restore the fields, so the rain of His Spirit restores and refreshes us daily. Ephesians 1:3 points to our being “blessed with every spiritual blessing in the heavenly places in Christ Jesus.” We are chosen, forgiven, adopted, given access to the Father, blessed with all the gifts of the Holy Spirit, and yes, we are ”heirs of God, and joint heirs with Christ” (Romans 8:17). Like the earth that “drinks in the rain that often comes upon it” (Hebrews 6:7), making it fruitful for those that cultivate it, so we, as we cultivate our lives and receive His “showers of blessing” find our needs are provided for, and we become fruitful, even to blessing others. And feel Your mercy and Your love. Where we realize the richness of Your grace. So God’s abundant blessings can abound. Then the gifts of Your Spirit we are blessed to know.